Robin was working on this album at the time of his death, and it was finished with the help of his wife and son, Robin-John. The album was as strong as anything he had done at ay point in his career and shows that he still had much to contribute at the time of his death. The album has a contemporary sound and is a return to good quality song-writing, after his somewhat disappointing Magnet album, which focussed too much on trying to get down with the kids at the expense of a good song. There are a number of stand-out tracks on this album. 'Days of Wine and Roses' builds from a gentle ballad, to a rousing bagpipe-led crescendo. 'Alan Freeman Days' is a lament to lost heroes and times, and 'Sanctuary' is a driving, indie-style rock masterpiece, which could have been a huge hit if released as a single. 'All We Have Is Now' is perhaps one of the most beautifyl songs Robin has written and wouldn't have been out of place on the melodic How Old Are You album. 'One Way Love' is a quirky pop song, written with former Radio 1 DJ Mike Read, and intended for Peter Andre but never finished. Other interesting features include 'Instant Love', an instantly hummable pop song, written and recorded with his son Robin-John, who actually sings lead on the second verse. 'Mother of Love' is a song that previously featured on the My Favourite Carols album, but sits much better here. And 'Sydney' is the final song Robin wrote and recorded. Indeed, he had not even finished it on his death, and it was recorded on an iPad as a demo, but his family has finished the production for him. Although rough and ready, it looks back over good times with his two brothers in Sydney and is a fitting final song for this album and this great man's career. If there is a criticism of this album, it is that some of the songs in the middle section portion of the album lack distinctiveness ('Anniversary', 'Sorry', 'Cherish', 'Avalanche') and perhaps needed more work, but this is an unfair criticim since the album waas never actually finished so we do not know for certain what Robin would have done with it. 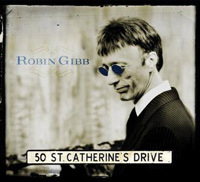 Why 50 St Catherine's Drive?